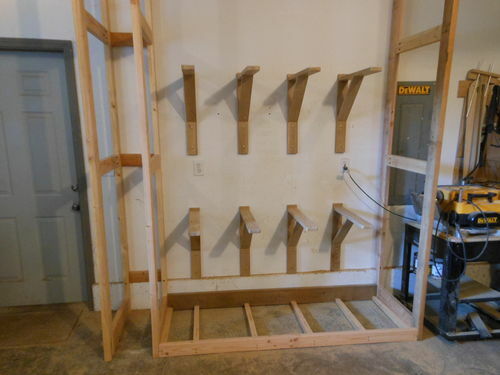 I found the need for a lumber rack, and knew I wanted to orient the lumber vertically. From my many lumber shopping adventures, I find it easier to sort through and retrieve lumber from vertical racks. The far left compartment is for sheet goods. 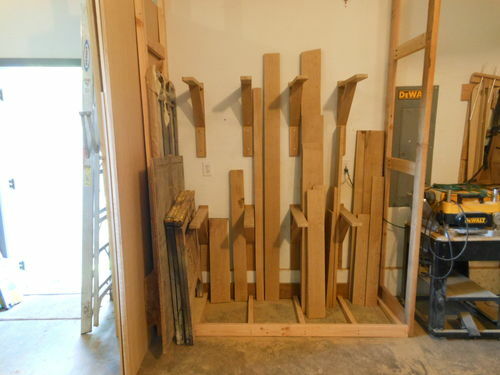 The rest of the rack will store hardwood. 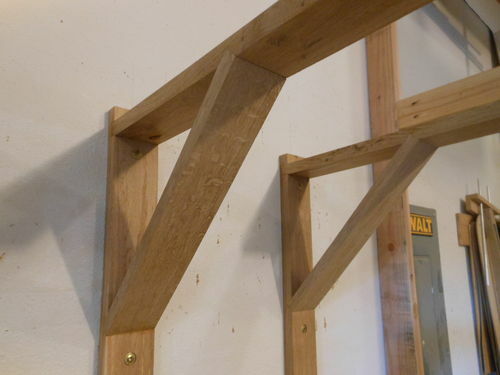 The rack is made from 2x lumber which ties into the top plate of an exterior wall, and to a beam. 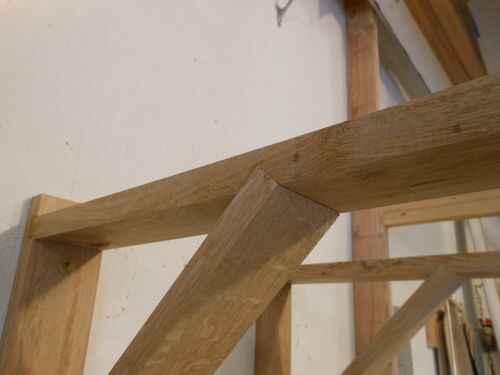 The brackets are made of scrap white oak. They are assembled with dados, glue and screws. 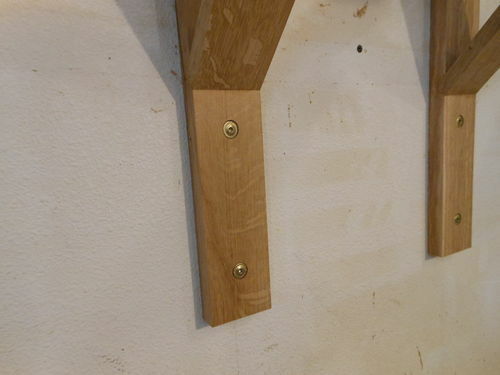 The brackets are secured to the wall with 3 Spax screws each. In reality, the brackets don’t need to carry much load but they feel quite sturdy. 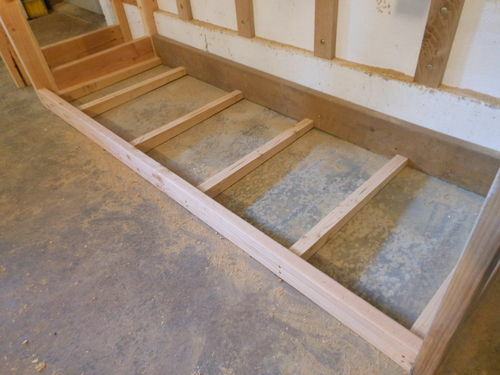 For the base, I used a 2×6 along the wall, which will set the lean angle of the lumber. 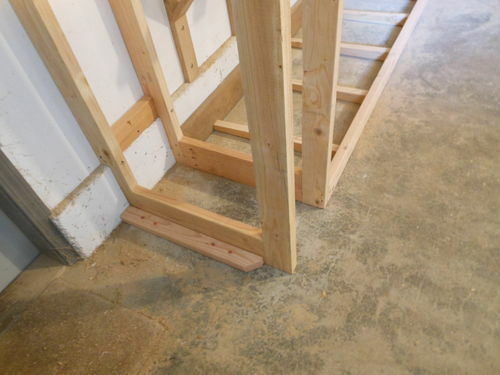 I also installed angled joists that will support a plywood floor. The only plywood I had on hand was a couple sheets of quartersawn white oak, which I didn’t want to sacrifice for a lumber rack. Next time I pick up some shop ply, I will add a 3/4” floor on top of the joists. The sheet good rack is anchored to the floor with ram set nails. Now I can start filling up the rack. I already had a bin for short offcuts, which works fine. And with all this new floor space, I decided to make a name sign with my son. Looks really good Willie and it also has the hallmark of your skillfully produced furniture. I wish I had room for something like this myself. As it is, I have a long platter cart and really no place to store my timber, except in shop loft. 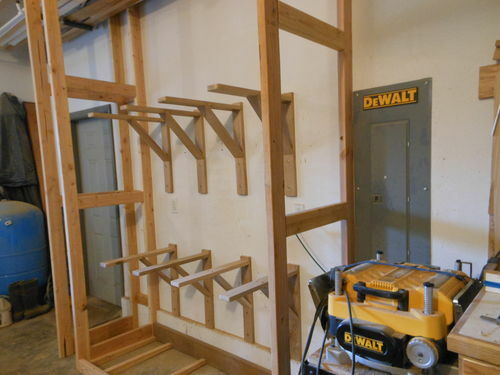 Yes, you definitely need some dedicated space for a lumber rack this size. Hey Willie, another fine project on your part. I have a question, though. Does vertical make warping any more likely? I know that woodcrafters orients almost all of their lumber vertically, but when I get stuff home, I always lay it flat on an edge to prevent warping. I don’t know if I am right or wrong in assuming this will help. I DO know that when I lay a board flat on its side ( as opposed to on edge ), it’s guaranteed to cup overnight. 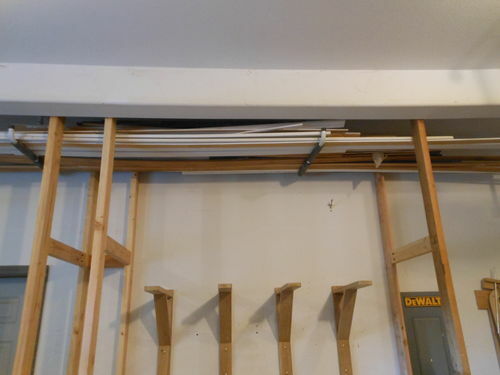 The rack holds the lumber nearly vertical, so warping is not an issue. Crosscut lumber sells their lumber out of vertical racks, and it is pretty easy to access. 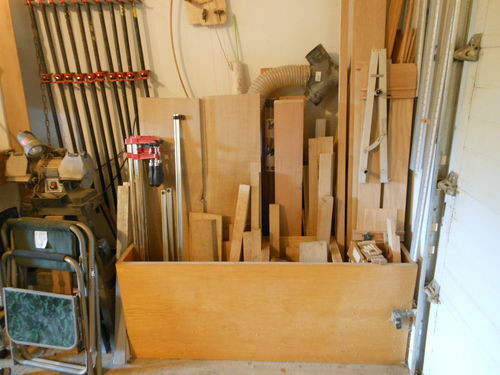 Man, I got grief for making my lumber rack out of oak…..yours is even quartersawn. Your sure to make people scoff….lol. Nice! That should be a lot easier to pick through that flat storage. I’m with Red: QSWO for lumber rack? Looks and sounds like a gr8 wood storage solution. Like others have said, it’ll be easy to pick through to find what you need. I mostly use QSWO for furniture projects, so I always have a pile of seconds on hand. For me, it is actually cheaper to use this rustic oak than to go buy fir. I think I paid $.39 per BF. I’m a bit jelly (read: jealous) of that QS oak bracket action. Under two pence bf? Now I’m super jelly. also, did you use a template for the sign, or freehand? The joints were cut with a dado blade at the table saw. I angled the dado blade, and increased the depth of cut until the board seated fully in the bracket. 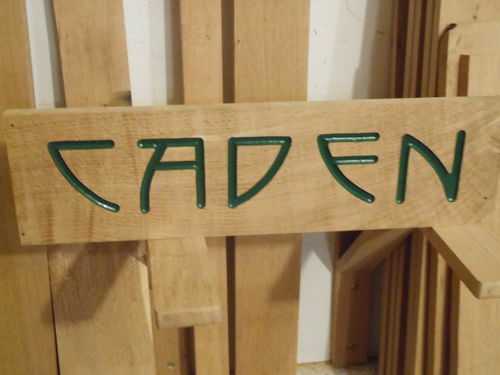 The sign is made with router templates. I couldn’t find a font I liked, so I made my own templates from 1/4” mdf core plywood. Wow! That’s a big rack. Wish I had room for that. Well thought out. I like the details.